Mini-lathes are very good at cutting threads. Using the ability of the lathe spindle to drive the leadscrew we can keep cutting many different internal and external threads so long as we think of new ways to arrange the change gears. However, what happens when we want an internal thread in a job to take an M5 bolt? The threading capacity of the lathe will not be much good to us here, unless we have a very very small internal threading tool and a very large amount of time on our hands. For small holes, up to about a diameter of 16mm, it is advisable to make an internal thread using a metalworking tap. A tap is a internal threading tool made from a peice of hardened steel specifically for making screw threads. Bottoming Tap - has a cutting edge right to the end for making a thread to the bottom of a blind hole. Taper Tap - has a long taper and is commonly used when the material being tapped is tough to work with. When starting with a lump of metal, we do not use the tap to make the entire hole, and the thread. No. We first use a standard drill to make a hole, and then use to tap to thread that hole. What size should the initial hole be? The table below shows the common sizes - it is often useful to keep a stock of drill bits with the taps - to avoid wasting time trying to find the correct drill bit and matching tap. It is also possible to buy sets of drills and taps of the correct sizes. A 2mm drill bit does not have a great life expectancy, so buy several drill and taps! Here is a selection of the drill sizes that go with common tap sizes. If you are "tapping a hole" ie using a tap to cut a thread into a drilled hole by hand, it is normal to hold the tap in a tap wrench. These are available virtually for free on places like ebay. You twist the tap into the hole, and, every couple of turns in, you make a half-turn backwards. This helps break up the chips that the tap cutting edge are making. It is important to use a cutting fluid with the taps. When cutting aluminium, use kerosense or WD40. When cutting steel use some oil. It is very easy, especially with thinner taps, to break the tap. If the tap snaps off in your hole, then you are in trouble. Always make sure sure keep the tap properly lined up with the hole being tapped. This is difficult to do by hand. This process is not normally recommended in the text books, but I find it works well in holes up to about M6, after which, the micro mill runs out of power. It is possible to use the rotational action of the micro mill to turn the tap and tap the hole. Of course, the tap must be drawn into the hole as the thread is cut, so you must be careful. 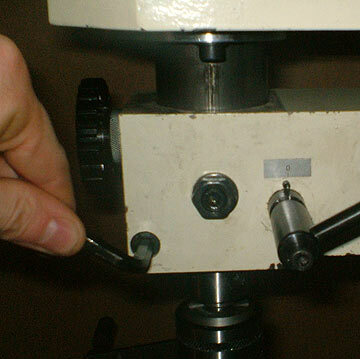 Loosen off the quill clamp bolt on the micro mill as shown right. This allows the quill to move easy. Using a drill chuck in the micro mill, first drill the correct sized hole in the part as shown in the table above. Lower the tap down until it touches to work, with the large quill handle wound fully up. Give the hole tap and hole a generous squirt of kerosene. Set the mill to forwards direction. Place on hand on the speed control and one hand on the quill "drill press" handle. "click" the power into the on position.. the mill will not move at this point. Put some force down on the drill press handle - perhaps the weight of your forearm. Slowly increase the power until the tap starts to turn..
Then reserve the process to bring the tap out - lifting the drill press handle to raise the tap out as it unscrews. You might have to do this in stages to get the chips out of the hole, especially if it is a blind hole. This does not give a particularly perfect tapped hole, but it is usually good enough, and much faster than doing it by hand.